India has been up there since July 18, 1980, when it became the eighth to demonstrate it could send a satellite to orbit above Earth. India launched the satellite Rohini 1 on an Satellite Launch Vehicle (SLV) rocket from the Sriharikota Island launch site. Indian cosmonaut Rakesh Sharma spent eight days in 1984 aboard the USSR's space station Salyut 7. 1963 - The first sounding rocket was launched Nov. 21 from TERLS. 1965 -Space Science & Technology Centre (SSTC) was established in Thumba. 1967 - Satellite Telecommunication Earth Station was erected at Ahmedabad. 1969 - Indian Space Research Organisation (ISRO) was created August 15 in the Department of Atomic Energy. Since then, ISRO has managed India's space research and the uses of space for peaceful puroposes. 1972 - The government established the Space Commission and the Department of Space (DOS) in June. DOS conducts the nation's space activities for ISRO at four space centres across the country. DOS reports directly to the Prime Minister. 1972 - ISRO placed under DOS on June 1. 1975 - ISRO made a Government Organisation on April 1. 1975 - Aryabhata, the first Indian space satellite, was launched for India on April 19. 1979 - Bhaskara-I, an experimental satellite for earth observations, launched on June 7. 1979 - The first experimental launch of an SLV-3 rocket on August 10 did not place its Rohini Technology Payload satellite in orbit. 1980 - India successfully launched its own Rohini-1 satellite on July 18 on a Satellite Launch Vehicle (SLV) rocket from the Sriharikota Island launch site. 1983 - The Rohini-3 communications satellite, launched in August, had by the end of 1985 extended nationwide television coverage from 20 percent to 70 percent of the population. Today it is about 90 percent. 1984 - The first Indian cosmonaut became the 138th man in space when he spent eight days aboard the USSR's space station Salyut 7. Squadron Leader Rakesh Sharma, a 35 year old Indian Air Force pilot, was launched to space along with two Soviet cosmonauts aboard Soyuz T-11 on April 2. While in space, Sharma conducted multispectral photography of the northern region of India in preparation for construction of hydroelectric power stations in the Himalayas. Sharma and his backup, Wing Commander Ravish Malhotra, had prepared in advance an elaborate series of zero-gravity Yoga exercises that Sharma carried out while aboard Salyut 7. Indian Space Research Organisation's manned space program has depended for the most part on the Soviet Union. 1987 - The first developmental launch of a larger Augmented Satellite Launch Vehicle (ASLV) rocket on March 24 did not place its SROSS-1 satellite in orbit. It could lift a 300-lb. satellite to an orbit 250 miles above Earth. 1988 - The second developmental launch of an ASLV in July also failed. Later, the third and fourth attempts would be successful. 1992 - The Indian-built INSAT-2 geostationary communications and meteorological satellite superseded an American-built INSAT-1. 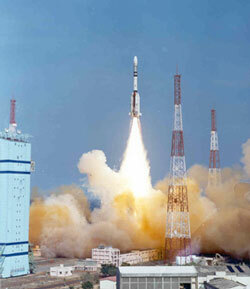 1993 - The even larger Polar Satellite Launch Vehicle (PSLV) debuted in September, but failed to attain orbit. Its individual elements were successful. PSLV can lift a one-ton satellite to a Sun-synchronous polar orbit. 2001 -- The first launch of a still larger Geosynchronous Satellite Launch Vehicle (GSLV) rocket was successful on April 18. GSLV can boost a 2.5-ton satellite. In addition to placing large communications and weather satellites in high stationary orbits, India plans to use GSLV rockets to send probes away from Earth to explore the planets. Missions to Mercury, Venus and Mars are under consideration. Vikram Sarabhai. Vikram Ambalal Sarabhai founded India's space program after envisioning Indian satellites that could provide communications, meteorology, remote sensing, and direct-to-home television broadcasting. He founded the Physical Research Laboratory, the Space Science Research Institute, the Department of Space, and the Indian Space Research Organisation (ISRO). In 1962, Sarabhai organized space research as chairman of Indian National Committee for Space Research (INCOSPAR). He set up of the Thumba Equatorial Rocket Launching Station and began manufacturing sounding rockets in India. He drew up plans to transmit education to remote villages across India with the Satellite Instructional Television Experiment (SITE). Satish Dhawan. Another early dedveloper of India's space program was Satish Dhawan. He was the longest serving director of the Indian Institute of Science when he died in 2002.